What a wonderful performance and marriage with Henry's poems. Your performance as a singer and musician is delightful and I was completely taken by how you own this music. Your fellow musicians and singers are also superb in their performances. The CD continues an ongoing project that started with the re-editing and re-publishing of Chris Kempster's Henry Lawson songbook for the NSW Folk Federation. The CD features performances from a number of exceptional musicians from the Blue Mountains and beyond. The show features all the music from the CD, plus a commentary providing some fascinating insights into this complex literary figure. Please contact me for more information about booking the show. Copies of the CD can be purchased here. Copies of the songbook can be purchased here. "There are subtleties, skill and impressive musicianship in the way these songs have been put together and I suspect this CD and the live shows which Christine is planning will become a landmark in the interpretation of Australian folk song." 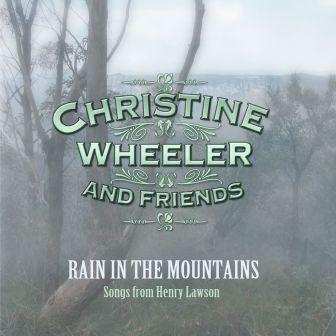 Rain in the Mountains, a production by Christine Wheeler and Friends, is a musical celebration of Henry Lawson’s timeless poetry. Expect rich harmonies, uniquely beautiful instrumentation, driving rhythms and pensive airs, with Christine’s strong, sweet voice leading the group. About a hundred years ago Henry Lawson’s poems appeared regularly in The Bulletin magazine along with the poetry of Banjo Patterson. The Bulletin organised a public rivalry between the two poets, with Banjo praising the bush as magnificent, grand and free. Lawson was more realistic. He spoke for the pioneers of the time, the people who actually worked in the bush, and eloquently but simply described their hardship and isolation, as well as their sense of fun and mateship. For many, this battler, who also spoke about social issues such as the futility of war, and spent much of his adult life a victim of alcoholism, is still a true voice of Australia. Over the past 3 years touring, the show has received an overwhelmingly positive response as a showcase of Australian cultural history and as a compelling union of timeless lyrics with stunning musical settings. From country waltzes to exquisite, introspective airs and lively comic turns, jazz-tinged ballads and upbeat anthems, the group has arranged settings by writers as diverse as country music icon Slim Dusty, John Schumann of Redgum fame, jazz composer Ade Monsbourgh and folk musician Chris Kempster, as well as several originals.